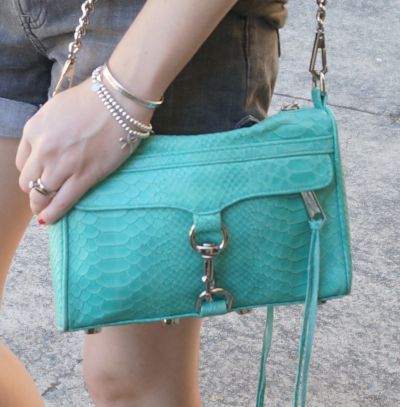 Two more outfits accessorised with my Rebecca Minkoff mini MAC bag in aquamarine. And a special giveaway for my US readers! I wear this bag a lot, it's my go-to for weekends when I want to add some colour to an outfit, and it looks good with everything, from a maxi dress to denim shorts. While I do have a lot of scarves, and after my last handbag clearout on ebay I have more scarves than handbags, I think handbags are the best accessory to invest in. If you take good care of them, they can last years. I bought this bag back in 2012, and while it doesn't look as pristine as it did then it's still looking really good! Definitely a wise purchase. I used this outfit as the one I posted to Instagram for the 'I'm loving this look' prompt for the Fox Pack Style Dare outfit challenge, even though I'd worn it the weekend before the challenge started. The day of the challenge was a much needed stay at home looking after baby in pyjamas day. I still have pyjama days. Hard to believe I once thought about getting rid of this dress! I was a bit happier to let things go from my wardrobe when I was pregnant though, I had to turn my walk in wardrobe room into baby's nursery so a big downsize was needed! Glad I kept it, it really is insanely comfortable. And I like it with this mini MAC bag, have worn that combination before. This dress was good for a quiet day at home with DH, and then a family birthday BBQ in the evening. I wasn't sure what necklace to wear with this, and was trying a few on when I realised these two looked pretty good layered together! :) Baby T wasn't too grabby either so I managed to keep them on the whole day. Last worn: Ray-Ban Wayfarers, tie dye maxi dress, Asos leather sandals, Rebecca Minkoff aquamarine mini MAC. Other ways to wear: maxi dress on Christmas day, pink sandals with a red bag, aqua bag with a navy tunic dress. The style challenge for the day was 'khaki', so I wore my khaki tee. I don't really have a lot of this colour (or any greens) in my wardrobe. I've mostly wear this tee with blue denim, so thought I'd be a little different and wear it with my black denim shorts instead. I thought the scarf added a nice bit of colour, along with the mini MAC bag. The pairing of the scarf and tee together is actually something that the personal stylist came up with during my wardrobe detox. I think it works really well! :) Certainly was a hit on Instagram with the other people participating in the style challenge. 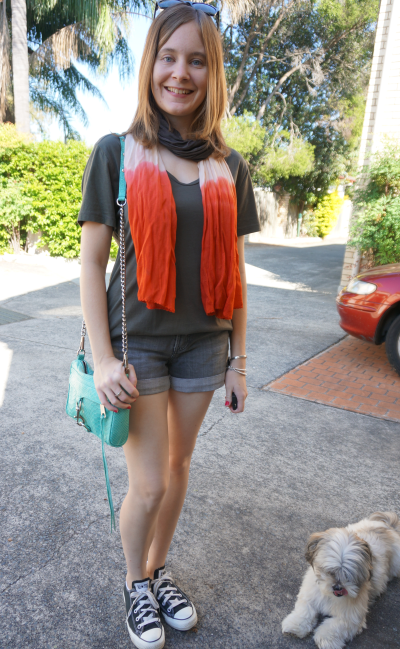 Last worn: khaki tee, dip dye scarf, denim shorts, Converse, mini MAC bag (above). Other ways to wear: ombre scarf with trench in winter, khaki tee with skinny jeans, aqua bag with a colourful printed tee dress. As promised, I am hosting a special giveaway for US readers! Unfortunately it is US only at this time, apologies to my Aussie and international readers. I had the chance to share it with you all and thought I would even if it don't apply to everyone. It's a chance to win a Microsoft Surface tablet, thanks to the Mom's Affiliate network that I am a part of. Note that this giveaway is only hosted on my blog, it is administered and run via Moms Affiliate. I have no input into the competition, other than providing you with a chance to enter. Details are on the post here, or you can fill in the entry form below. Good luck! Linking up with Styled Up, Let It Shine, Shoe & Tell, Style to Inspire, Mix It Monday, Celebrate Southern, More Pieces of Me, Daily Express, Real Mom Style, Reasons To Dress, Turning Heads Tuesday, Style Sessions, What I Wore, Spotlight Weekly today. I am so in love with the bag. The colour is gorgeous. Your hair is looking lovely in this post. Thanks Imogen! I seem to prefer straightening it since I had it cut, it just seems to play 'nicer' that way haha! That's a beautiful little bag. Love the color. And I also like the boho vibe of the first outfit, with the tie dye and the stacked long necklaces. It was definitely a great choice to keep that maxi dress! I love the subtle tie die and the lavender/grey color. Perfect choice to accent it with a turquoise bag. And your scarf outfit is so fun too! Great colors once again, and fun edgy/casual touch with the Converse. Cute outfit!! love the print on the dress, and that purse!! Love that dress, very pretty! I remember the first post when you just got this mini MAC! I partially blamed you for me ending up with one too lol! However I had to let my go recently because I just couldn't work with smaller bags (couldn't fit enough in it and it really bothered me). On the other hand, so happy to see your little croc mini MAC is still rocking!! haha yes you've been following along for a while! thank you <3 I can fit just the essentials in, which is perfect and all I really need. But most days I am carrying a giant baby bag too if I need to store something more, ha! Love the maxi dress, so pretty! Glad you got to wear the necklaces without too much grabby hands going on, I remember when my son was teething age/let's pull on everything age I couldn't get away with wearing necklaces. I'm so glad you kept that dress. I had the same "I want to get rid of everything" problems about 4 months after having Penny. It was summer time and I wasn't feeling the best with my new post baby rolls. This fit me pretty uncomfortably, but a few things I held on to. This year, as I unpack last years Summer wardrobe, I've finding the fit of everything to be so flattering. You never realize how much your body actually changes until the seasons do. I'm so pleased you know exactly what I mean! It's tough as I really want to get rid of things, but I don't want to be overly critical and let go of some great pieces. Like you said, things are always changing with pregnancy and post-baby so it's hard to know what to keep and what to get rid of some days! I love the color of that, so cute and refreshing. I love the color of your mini MAC! I have it in black and gold, which is classic, but it's sort of plain for spring and summer. Your maxi dress is stunning on you. i love the pattern and the cool colours. The aquamarine looks amazing with it. 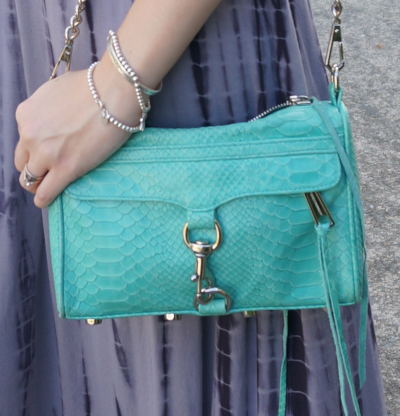 I just love any outfit paired with that Rebecca Minkoff bag! I swear it looks good with everything! That bag really is the perfect size! I would wear it a lot too if I owned one! Hand bags are easily my favorite accessory to have and to invest in! That dress is SO stunning! Very pretty look. I love this bag, very versatile. the aquamarine color of your bag is gorgeous!! Love the maxi and the MAC is a beautiufl color! Both are great looks! Love that bag! I love when pieces transcend time like that. I have a few that I've kept myself like a Balenciaga city I got nearly 10 years ago. Sadly I am terrible at keeping things pristine, handbags never last long in my clutches. That particular bag has a stud missing and somehow I managed to split one of the leather tassel zip things. I'm trying to get better as I'm getting older and aiming to be less wasteful. Time will tell. haha I used to be terrible with bags too, I treat them a little better now I buy expensive ones, but I prefer ones I don't have to baby too much. Did you talk to Balenciaga about the stud? Definitely something they should fix! The leather tassels frequently split with use though sadly, that's a common thing. I love how Balenciaga bags soften and age - split tassels or not! So glad you didn't get rid of that dress! Looks great on you! You're right Mica. that bag looks great with both outfits. Awesome pop of color. hurray for that turquoise RM bag! :D so perfect for the warm weather! TOTALLY jealous of that bag. The color, the fringe, the material, the label!! And it is so perfect for this season, you styled it perfectly. I would have never guessed that it was a few years old, a great purchase for sure. Thank you for joining the #reasonstodress real mom street style linkup and I hope to have you back next Tuesday. Thanks! It is a cute and practical little clutch bag, I'm really glad I got it. that aqua marine mini bag is so cute! This bag is seriously gorgeous - perfect practical size but in a super fun colour! Paired with that tie dye maxi it's a match made in heaven! I have such an affinity for that Rebecca Minkoff purse I got each of my bridesmaids one as a gift when I got married. Love the color!